3D slot games - Play 3D video slot machines online for free! 3D Slot machines or “one-armed bandits” as they are known have been around for decades, and are staples in casinos from Las Vegas and Atlantic City to Monte Carlo and Macau. In recent years however, the classic poker machine game has undergone a change that has seen the popularity of the slot machine rise. Enter 3D slots games. Gone are the days of five or three reels with animated symbols. The moment you sit down in front of you, you get the feeling that something is different about these slot machines. Then it hits you as the game is introduced with a short movie that introduces the characters, the plot and storyline with a cinema-style trailer complete with voiceovers. Not bad for a 3D slot machine. 3D games are fully animated. You are not just waiting for the symbol reels to stop spinning, but you will find yourself drawn in to a complex story with names and animated characters that play a part in the game, creating a unique experience where every time you pull the handle (or punch a button), the plot and events unfold before your eyes, making you a part of the action. 3D slots such as these have taken gambling and turned it in to a fully immersive interactive experience where every spin of the reels advances the plot and keeps you hooked, wanting to know what happens when the reels come to a halt. 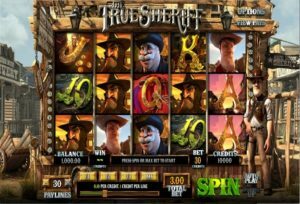 These particular slot machine games use stunning high resolution graphics to bring these characters to life amidst cinema quality musical scores and sound effects to create immersive in game experience that more often than not has sporadic short video clips that create a cinematic experience. The developers of such 3D slot machine games have pull out all the stops. One of the benchmark games of the genre is Crazy Jewelry, developed by Rival. As the name implies, you have five reels that are the front of a Jewelry shop located in a small town somewhere in Italy. But that’s just the beginning: The security guards, their scooters look and move like the real thing as atmospheric background noise such as the chatter of birds, traffic and a radio playing opera can be heard in the background. You have already been drawn in to the world of the game and you have barely sat down and gotten comfortable to play this 3D slot game. At the moment, two gambling software development companies rule the field of 3D Slot games: Betsoft Gaming and Rival that together have over forty unique 3D slot games. At present, Betsoft dominates its closest rival with 36 3D slots games that guarantee you hours of entertainment as part of a fully immerse interactive experience. In contrast, Rival’s finest six 3D slots games are only showcased in luxury casinos. No matter which of these 42 different slot games you decide t play, sit back, and enjoy the immersive cinema like experience as you gamble your way through the story while seated at a 3D slot machine. Walk in to any casino, anywhere in the world and you’ll find them situated somewhere on the gambling floor. Slot machines now use 3D software to attract players of all ages and from all walks of life with the metal on metal sound of coins crashing in to payout trays and oversized soda glasses. 3D software slot machines have been a hit in real world casinos and it was not long before they went online, as part of the numerous online casino sites, and it’s no longer just a choice of classics. The use of 3D software is something new, and numerous gambling software development companies are betting on it to win big by developing and releasing a plethora of 3D software slot machine games. The latest in cutting-edge high quality casino slot games are all in three dimensions (3D), complete with sound effects and music, embedded videos that tell stories, making gambling in to an immerse online experience. Best of all, everything remains as user friendly as ever and no special eyewear is required to enjoy the experience of 3D software. Of course, you have your pick of the companies and their 3D software games to choose from.